Tracker Bars are named after the style handlebars often used for flat track racing. 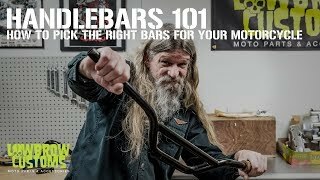 Their low rise, lower than most stock handlebars, will typically allow you to use your stock wiring and cables making installation a breeze. Tracker Bars can also be used on a taller handlebar riser. Ther was a shioinf mastake. L.B. handled this very quickly & at ther extra expence. Ten points with me!!!!!!! I was psyched about getting these handlebars for my 1993 Sportster XLH 1200 and was even more psyched when I pulled them out of the box after arrival. They are of exceptional quality and look awesome and feel great mounted on the bike. Thanks to Lowbrow Customs and Biltwell for a superior product and a new and dedicated customer. Great bars that are great quality. The chrome is perfect and these bars give my sportster that more aggressive riding position while still sitting upright. Biltwell are the only new bars I buy.